With the development of its “Modular Solutions” the EMAG Group was already responding to these developments by 2012. These “building block” solutions ensure highly effective and customized machining processes, from turning and grinding to gear hobbing. At the same time, the machines can be linked together easily thanks to their uniform transfer heights, software control, and internal automation systems. 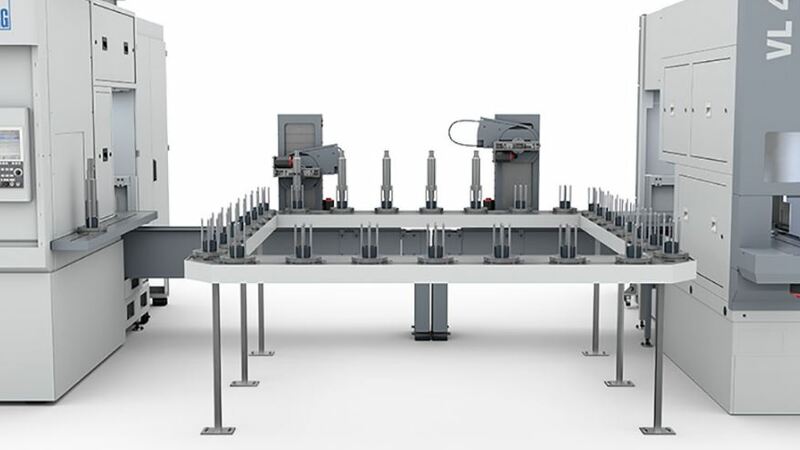 The “Modular Solutions,” which also include high-productivity VL turning machines for chucked parts, DUO machines (dual-spindle pick-up turning centers), and vertical hobbing machines, have since become the fastest-growing segment and growth engine in the EMAG Group. EMAG’s proprietary automation technology “TrackMotion” plays a crucial role in this: In this automation system, a so-called TransLift unit with a programmable electric gripper runs on a track more or less right through the machines. It picks up the raw part from a parts storage unit and transports it to one of the VT machines. It is then taken over by the pick-up automation system in the EMAG machine or by the workpiece gripper in the turret. Once the machining process is completed and the part is deposited by the pick-up spindle onto the outer drag frame, the TransLift unit conveys the part onward if required. Ultimately the combination of “modular” machines, various EMAG technologies, and the TrackMotion automation system opens up all kinds of possibilities. Even complex production lines for rotor shafts can be created, including soft machining, laser welding, hardening, hard machining, and grinding—and a simpler, more reliable, and more effective solution would be hard to imagine.